Iconic. 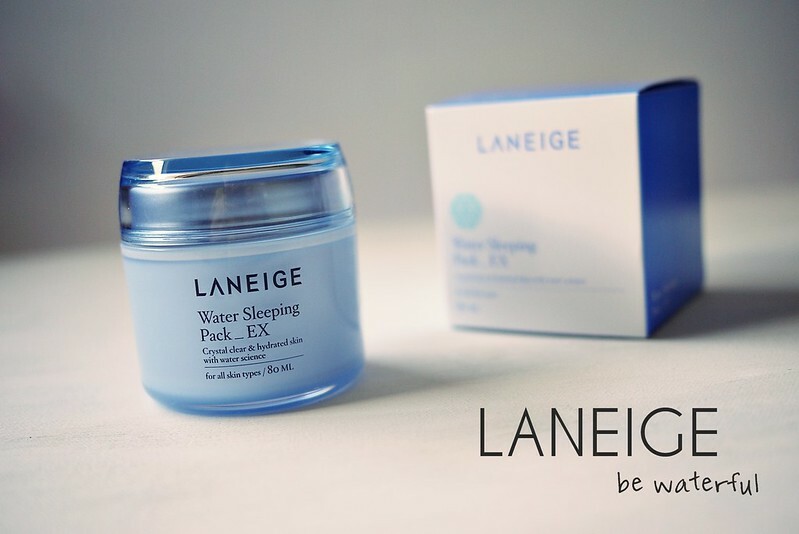 I think that is the first word which comes to mind whenever I see the little blue jar that is the Laneige Water Sleeping Pack. Of course it wasn't always blue and sometimes it's even decorated with limited edition artwork but the fame of what is inside has never faltered. As one of the brand's best selling products, it's popularity has reached all around the world...and of course, right into my palm. If you're just getting acquainted to Korean skincare, the term sleeping pack may seem rather perplexing but in function it is exactly as it sounds, a "pack" or face mask which you wear as you sleep. The inventions of these products stem from the idea that our bodies (skin included) are most receptive during sleeping hours which makes it a great time to treat your skin. 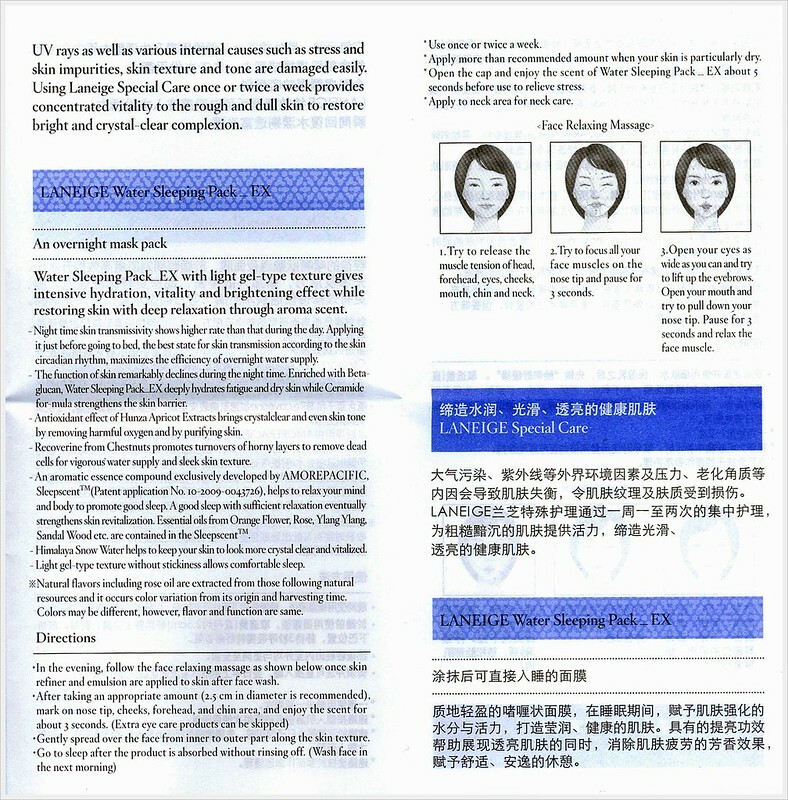 I have memories of sampling the Water Sleeping Pack years ago when I first got interested in Korean skincare. While the packing has changed little since then, the newer EX version no longer contain alcohol and is marketed to be more effective overall. Once opened I was pleased to find a small spatula along with a mulch-lingual instruction sheet. 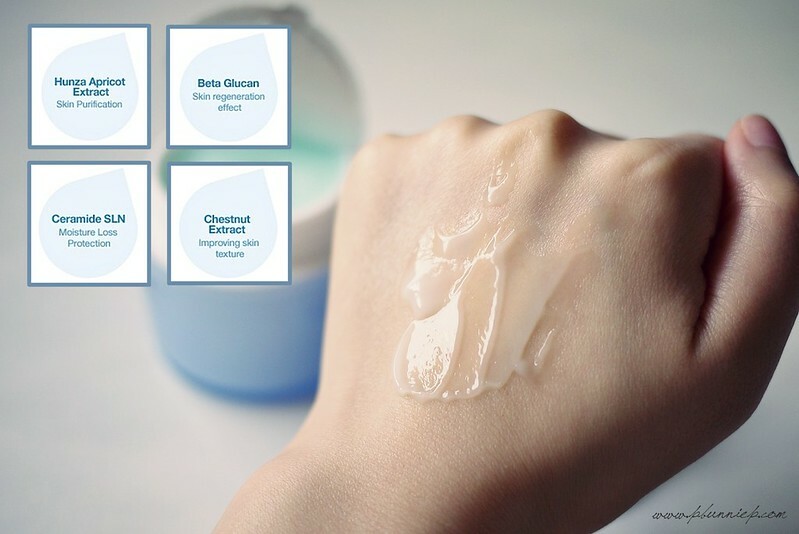 The pack itself is tinted a pale translucent blue and has a gel-cream consistency, similar to the appearance of the Clinique Moisture Surge cream. What surprised me straight away (and this goes for all the new Laneige products I've been using recently) is how much more pleasant the scent is. In my first encounters with Laneige, they were notorious for overloading their products with fragrance but it seems like they have improved for the better. To my nose this smelled quite mild, perhaps a bit soapy with a spa-like feel to it. Recommended to be layered as the moisturizer to your night routine 1-2x per week and washed off in the morning, it's main function is to provide intensive hydration though it also claims brightening and repairing functions for "crystal clear" skin. 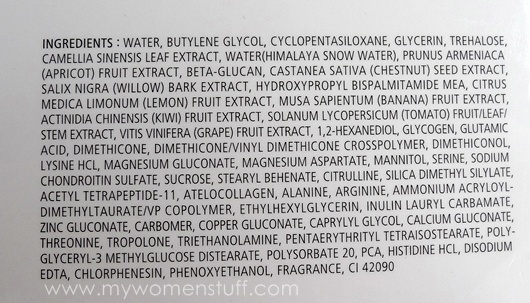 Here's a look at the ingredients courtesy of ParisB from My Woman Stuff (mine only listed ingredients in Korean) and as you can see it does contain a hefty blend of plant and fruit extracts along with the infamous Laneige keystone additive, Himalayan Snow Water. Application wise this was neither sticky nor oily, given that you take care to apply a small amount just slightly more than your night cream. I've used this both on it's own after cleansing and also tried it layered over my toner/emulsion, in both cases I had no problem of it sitting on top of my skin (the main reason I tend to avoid gels). 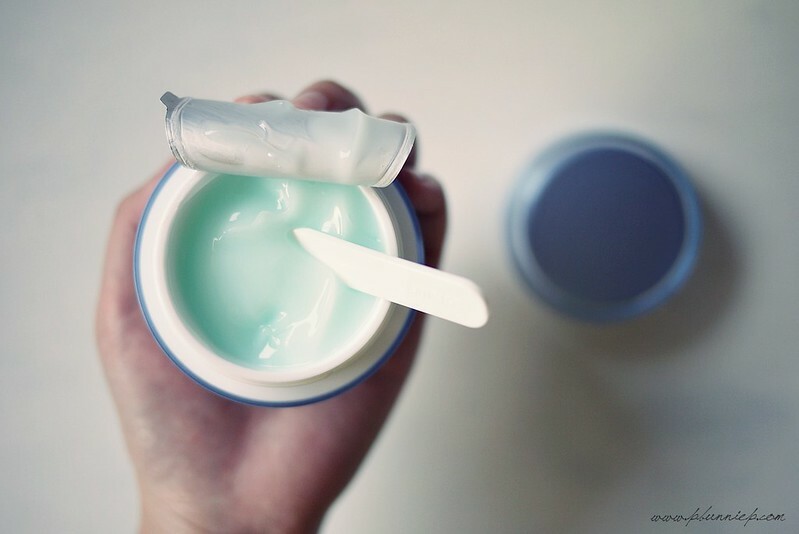 In fact, I find the texture tends to "melt" into a lighter consistency once I start to spread this over my face which made it quite comfortable even in the summer weather. As with any sleeping pack, the morning test is the most important and Laneige seemed to pass with great results. My skin looked plump, smooth and calm without any greasy residue. If my eyes aren't fooling me, I may even say that my pores looked reduced likely due to being puffed up with hydration. After a few more continued trials, I'm also glad to report no sensitivity, breakouts or other adverse reactions. To me this was especially important as layering products can sometimes overwhelm my skin instead of doing it good. On the brightening aspect of things, I didn't see any significant results so I would still categorize hydration as it's main strong point. 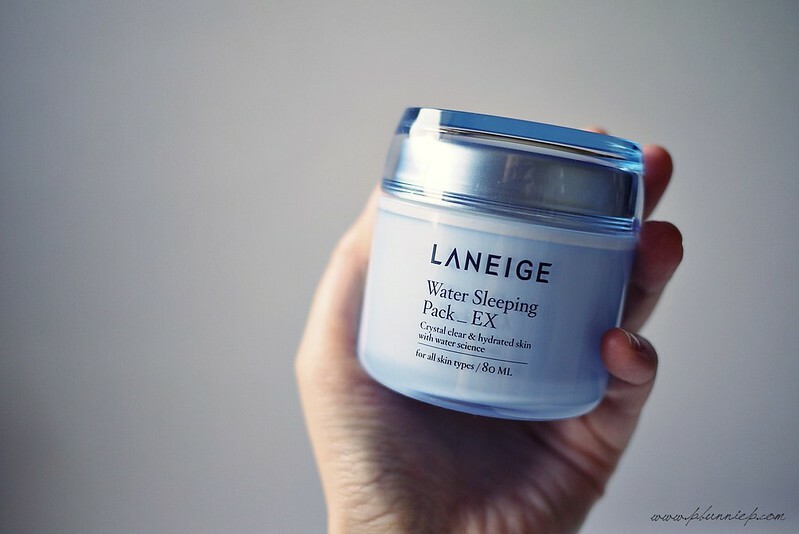 The Laneige Sleeping Pack EX surprised me in so many ways and you can say that through this experience I'm starting to really like the direction that Laneige taken since we last met. Everything from the lighter scent to the more refined texture shows a more modern improvement from the Laneige I used to know 5-6 years ago. I think this product has great potential as an add-on to your skincare routine whether you have dry skin or your skin just gets dehydrated easily like mine all year around. The mild scent and gel-like texture makes this a unisex product that I feel would work just as well in a men's skincare regime. For anyone using more intensive acne treatments what has the tendency to cause dryness and flaking, this may also be a useful product to have at hand. And while I would not rely on this as a one jar cure all product, it does provide that little extra boost when I need it without excessive burden my skin and for that I'm happy to give it a place on my skincare counter. 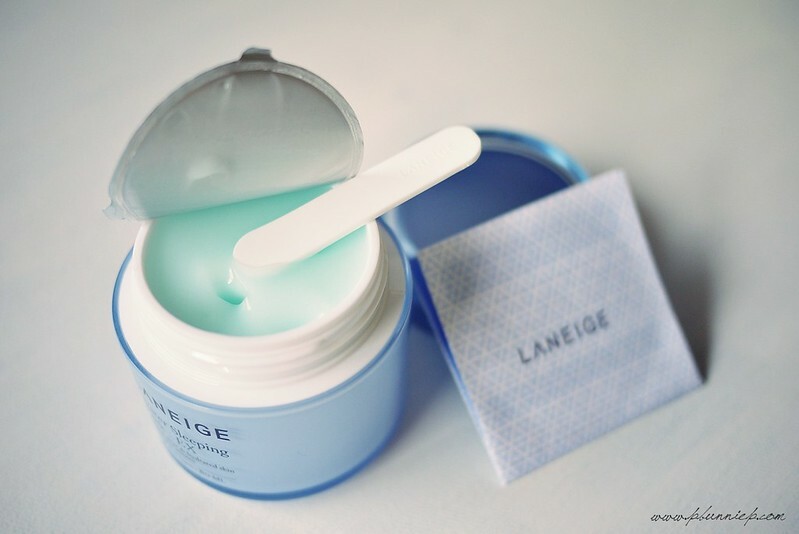 Are you a Laneige fan? What do you think of the idea of a sleeping pack/mask? 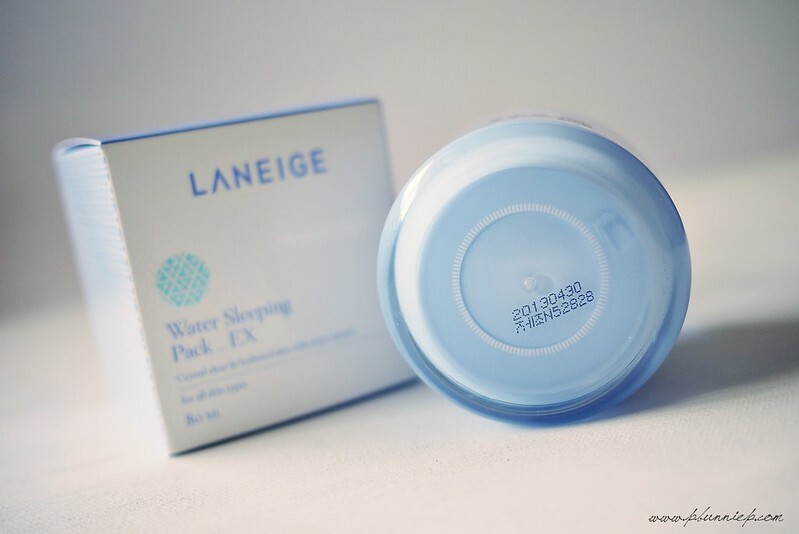 I love the Laneige Water Sleeping Pack! I always found the name of it to be rather peculiar, but it actually does make sense now you mention it :P I love how the gel is so cooling on the skin and it definitely gives a lot of hydration to the skin! It's been on my wishlist for some time! I don't buy Asian skincare too often, but next time I place my order on Sasa (or somewhere similar), I will definitely remember about Laneige. Sounds like something my skin would love! Thanks for this Gerry! I have always heard of Laneige products but I never used them. This sleeping pack is pretty popular among beauty bloggers I find. It might be something worth looking into, but I'm kinda skeptical about it because it might be too rich for my oily skin...any thoughts? I think the gel-like consistency should make it reasonably comfortable for oily skin. However, I'd mainly rely on it for it's hydration effects rather than skintone correction etc... so if that's not a big issue for you, I wouldn't say its a necessity. Lovely review! I have never tried a sleeping pack before, but they do seem to do a lot for the skin and this ones seems really good. Even though my face is oily it also tends to get dehydrated, so I guess something like this product would be nice. I loved your review. I've been using this sleeping pack for about a year and I had the same sensations as you had; in my case, I also did note some skin tone correction. I really do not know what I would have done without this Sleeping Pack it is truly amazing! I agree with what you are saying! I usually put this on if my face looks tired or is dry. The next morning it just looks so plump, smooth, radiant and the Sleeping Pack does also make my pores look smaller! Hi! do you recommend it for oily skin? I'd say if your skin tends to get dehydrated at times then yes, if not, then I wouldn't bother. Sometimes oily skin can get imbalanced and get dry patches (dry/rough on the surface, oily underneath) but it really depends on your own particular condition.